SSD caching trend on the rise? In the four years that SSD’s have been available at the consumer level, their popularity increases to grow. Initially only attractive to the enthusiasts with fat wallets and the need for speed, these drives are starting to become an affordable and attractive option to us mere mortals that work for a living. With the innovation in the SSD space, over the past four years, many of the initial pain points surrounding SSD drives have become less significant and more tolerable. Price per gigabyte has gone down, life expectancy has gone up, and performance has continued to increase widening the gap between SSD drives and traditional spindle drives. So it’s no wonder why everyone wants one (or more). With all their positives, SSD’s still fall short of providing a complete solution for most users. The reality is the storage space required to adequately support users today, simply can’t be covered by SSD’s alone. The current “sweet spot” in regards to SSD drive capacity appears to be 128GB. Once you get beyond 128GB, the cost quickly ramps up into the realm of “you’ve got to be kidding, right?”. I consider myself an average PC user, and as such use my system for normal productivity purposes; family video editing, gaming, etc… and 128GB just can’t cut it. Hell, if used as a boot drive, and average Windows 7 install could use up to a fourth of a 128GB drives total capacity even before you install any applications and such. Faced with this dilemma, many current SSD adopters have resorted to using an SSD drive for their boot drive and traditional spinning HDD’s for raw storage space. This common SSD deployment method will provide the user with fast booting, quicker OS response, and generally hits the “best bang for the buck” mark. However, you’re only as fast as the slowest guy on your team and with that said, anything that is stored and launched from traditional spinning HDD’s will have their performance generally unaffected by the recently installed SSD. Now, since most of us can’t justify the cost of installing an enterprise-class storage controller in our home systems, there are several consumer solutions available. Intel released support for SSD caching with the launch of their Z68 chipset and Smart Response Technology (SRT). All that is required is an Intel Z68 chipset based motherboard and an SSD drive, and the SSD can be configured as a cache drive for an attached HDD. This technology has some limitations, but for users that already have a Z68 based motherboard and an SSD drive, there is no additional cost to implement SSD caching. Highpoint is releasing their RocketCache 3240X8, which is a consumer level adapter that provides SSD caching support. SSD drive vendors are also starting to jump on the SSD Caching bandwagon. 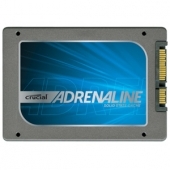 Such as OCZ’s Synapse Cache and Crucial’s Adrenaline Solid State Cache Solution. With the recent and upcoming releases of consumer level SSD caching solutions, it’s a clear where the market is currently headed. SSD drives will continue to offer raw speed and HDD drives will continue to offer raw drive capacity and the only real solution to leveraging both seamlessly will be SSD caching technology. This will be true at least until solid state media evolves enough to solve the capacity versus price dilemma.